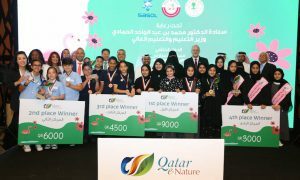 Qatar Foundation’s (QF) edutainment reality TV show Stars of Science has concluded its Season 10 auditions – and the competition has just begun. The jury has selected the top nine innovation masterminds who will now fly to join the workshops at Qatar Science and Technology Park to transform their ideas into products and compete for the show’s ultimate title of ‘Best Arab Innovator’. According to Khalifa Essa Al Kubaisi, Media Relations Manager at QF, previous seasons of Stars of Science have demonstrated the extent of the innovative ability that exists among Arab youth. This year’s contestants have already shown the potential to live up to the standards of the show. Four of the top nine innovators are women. From the Information and Communications Technology episode, two innovators survived the auditions. Sylia Khecheni earned her ticket to enter the prototyping phase with an intricate Home Privacy Drone Blocker, a device that stops video transmissions without damaging the source of the intrusive signal. Fellow contestant Rooda Al Qebaisi welcomed the opportunity to put her Dynamic VIP Seating Manager to the test. The compassionate and business-savvy nature of Anna Malek fuels her passion to ensure her Smart Car Seat not only protects newborn children, but also gives parents peace of mind; while scientific researcher Nour Majbour will work on her Parkinson’s Early Detection Kit to find a binary way of detecting signs of the disease in a timely way. The largest pool of contestants this year came from the biomedical rounds, with ten contestants in the shortlist, and five making it to the top nine. In the upcoming episode, neurosurgeon Walid Al Banna will work on his Neurovascular Google Analyzer, designed to aid doctors in detecting early signs of recurring strokes. Also entering the medical innovation arena is Ahmed Zahlan, the youngest innovator on the show, who has high hopes that his Contactless Gluten Detector will ultimately be used by those who struggle with gluten-related allergies. And driven by his zest for measurable results, Abdullah Al Sairafi will be seen aiming to perfect his Sports Performance Patch. With only two places remaining after these rounds, five hopefuls from the energy and environment episode competed for their final chance to book their spot among the show’s top nine. Artist Salim Al Kaabi has been selected to work on his Safe Frankincense Varnish for Artists, a product that nullifies the harsh side effects of varnish while retaining the ability to make timeless paintings. Meanwhile, Ghassan Oueidat stood out with his novel idea of using a Dry-Ice Cleaner Bot to autonomously clean tower blocks. Viewers can now tune in for the action-packed prototyping episode and see the top nine enter the studios for the first time in this season. With their mentors’ support, the contestants will see their innovations undergo constant development and design refinement to prepare them for the semi-final elimination rounds, where the products will be vetted by potential customers. In the Grand Final, four innovators will share a cash prize of $600,000 based on jury review and public votes. For a full broadcast guide to Stars of Science Season 10, visit starsofscience.com. Do you have what it takes to be successful on Stars of Science Season 11? The show is currently accepting applications for its next season until the end of December 2018. Visit www.starsofscience.info/applynow/sos.html to register.